This map of England ‘Anglia’ is by Christopher Saxton. It forms part of an atlas that belonged to William Cecil Lord Burghley, Elizabeth I’s Secretary of State. 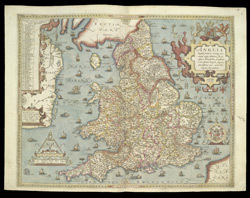 Burghley used this atlas to illustrate domestic matters. During the reign of Elizabeth I, map use became more common, with many government matters referring to increasingly accurate maps with consistent scales and symbols, made possible by advances in surveying techniques. This map was produced under the patronage of Thomas Seckford, a Master of Requests to Elizabeth I, who had commissioned Saxton’s atlas of county maps, a project overseen by Lord Burghley, Secretary of State, whose administration increasingly involved the use of maps. Here Saxton’s name appears in the decorative scale bar, as does the name of the engraver of this map, Augustine Ryther, the most accomplished of seven English and Flemish engravers employed to produced the copper plates for the atlas. The strap work cartouche is mounted by the Elizabethan coat of arms and the Seckford arms of appear beneath this. The decorative quality of the map is considerable, with around 50 species of sea monster and many ships populating the sea.